I use Flexgrid, and have a dropdown CellTemplate inside flexgrid. E.g. 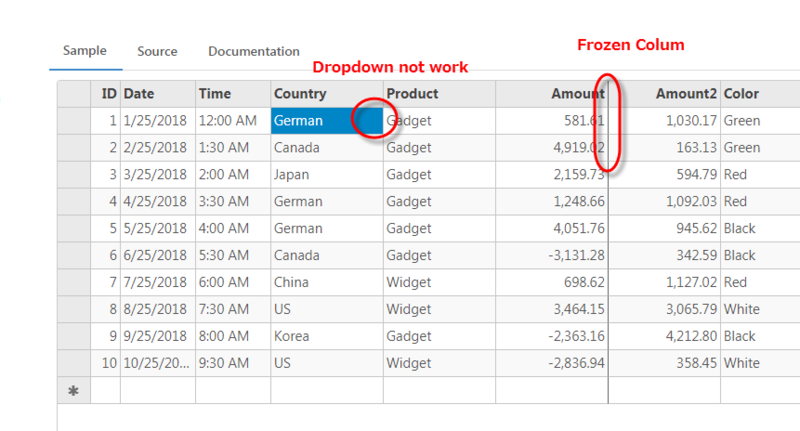 FrozenColumn(5), Dropdown column index 3.
if i frozen column before this dropdown cell, the dropdown will work fine. even i try in ComponentOne MVC Explorer demo application, it's same issue. please advise how to make dropdown work when got frozen column after dropdown. We are working on this and we will update you on Monday. On investigation, we found this issue as bug. Hence, this issue has been forwarded to the concerned team for further investigation with internal tracking id 317573. Thanks Manish, any workaround about this function before the Team fix this? We get response from the development team. The issue was because of z-index for frozenCells is set to 1 which covers the customEditor. Please find the attached sample which implements workaround for this issue by setting customEditor's container z-Index. Hi, may i know any official solution about this? We have requested to the team to get information on this. In case, it gets added, it will be included in the next releases which is expected to be release in Jul 2018. Hence, we suggest you to use this as workaround. We will let you know as we get further information on this. may i know when team plan to release new version for fix Frozen issue? i found another issue when use Frozen for FlexGrid. if use Jquery-UI to make grid resizable, the resizable will not work after Frozen. and one more: if use bootstrap Dropdown in frozen column, the dropdown not work also. We are sorry, we do not have any exact release date for next release. The next release should be in mid or end of July. Please try to invalidate the Wijmo Control on resize event for Jquery-UI resizable. 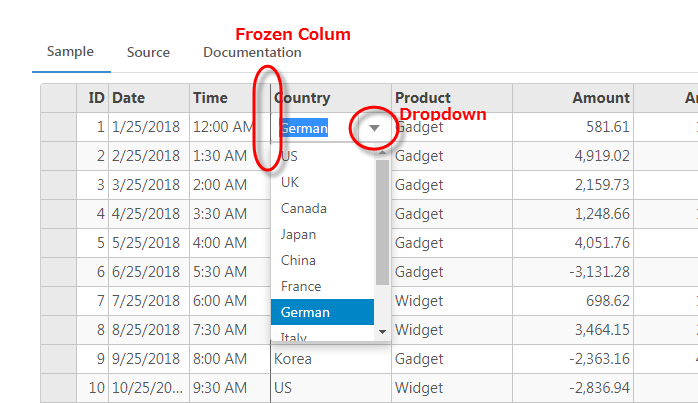 Could you please share code snippet how you are adding Dropdown for frozen column. Is the Dropdown placed for cell or for edit cell? then in FlexGrid ItemFormatter function to replace current cell innerHTML as below. Is the Dropdown working for non-frozen columns? If yes, please try to set CloneFrozenCells to false. thank you for your reply, i have tried, but still same. please refer to below gif. i already set .CloneFrozenCells(false) for FlexGrid. Could you please share build version? Please also find the attached sample that is used to replicate the issue at our end but we are unable to see dropdown for Non-frozen cells because of dropDown gets hide behind cells. Please let us know if the behavior is same at your end.